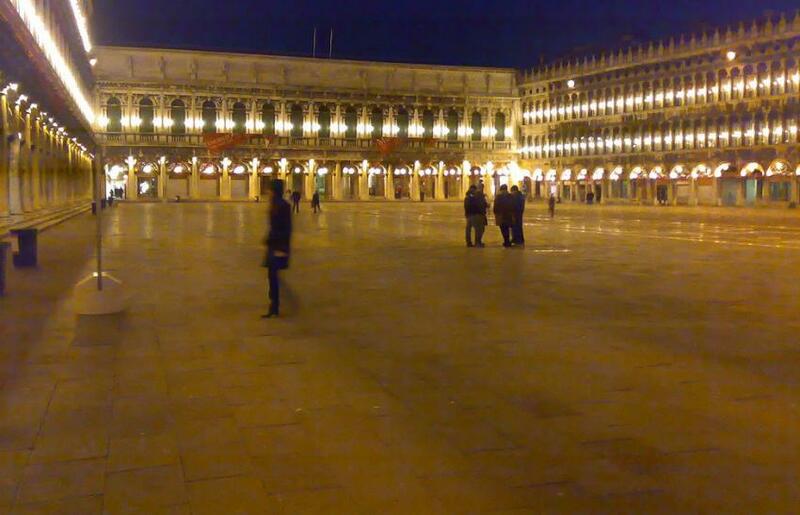 The Procuratie that run along the two long sides of Piazza San Marco were built as offices for the nine procurators (procuratori), whose positions were elective but permanent, and whose princely status was second only to the doge. Three were responsible for the upkeep of the Basilica and six were charged with maintaining the city on either side of the Grand Canal. The buildings are not identical; the one adjoining the Clock Tower, the Procuratie Vecchie, was begun by Mauro Codussi in 1500 and finished by Sansovino some 30 years later. The Procuratie Nuove opposite were designed by Scamozzi and Longhena between 1582 and 1640. But they are close enough in appearance to continue the city’s motif of looking-glass reflections, which, when the piazza is flooded, becomes surreal, and you feel as if you’re inside a magic box. Nowadays the city rents out the Procuratie as shops. Linking the Procuratie together is a similar arcaded building known as the Ala Napoleonica, (Napoleonic Wing) which the French built in 1810 to replace the last incarnation (designed by Sansovino) of the ancient church San Geminiano, out of an urge for symmetry and the need for an official residence for Venice's new ruler, Eugene Beauharnais (Napoleon's stepson by Josephine, Viceroy of Italy and 'Prince of Venice'). The building is a faithful copy of the Procuratie Nuove except for the cornice, crowned by a cast of Roman emperors; the empty spot at the centre was meant to hold a statue of Napoleon. The project was scarcely finished when it was inherited by the Austrians, who made it a a royal palace for the Habsburgs, who swanned around its ornate imperial rooms during their frequent visits to Venice. Now the President of Italy entertains here when he's in town. When Venice joined Italy, the city inherited the building and its contents- a handsome collection of ancient maps, Graeco-Roman statuary and medieval paintings, and used it to house the Museo Correr.